What does it really mean to do outside-in learning effectively? Everyone involved with corporate learning knows that learning needs to be designed from the outside in. We all try to start from the business objectives and work backward to the learning solution(s). But while this approach seems intuitively obvious, experience shows that there is not much agreement on what it really means to do this effectively, and no true understanding of why this type of approach is so important. Classic approaches to business learning all start with the business problem. You accept the stated business objectives and use those to derive a set of learning objectives that will allow the business objectives to be met. Outside-in learning development is more robust than this, driving to a more thorough understanding of the business problems and how to address them. What are the business objectives driving this initiative? You need to understand the objectives in in terms of their impact on key measures like revenue and profitability. It’s also important to understand if these objectives reflect shifts in business strategy and priorities. And how critical is this initiative to the ongoing success of the business? What will the business need to do or do differently to achieve these objectives? How will this impact business operations – will it change processes, functions, or priorities? What will employees need to do or do differently to achieve these? Will there be new roles and responsibilities for employees? Will the size of the staff or staff locations change? Will the changes involve new tools? What gaps exist between what employees can do today and what will be needed (performance-wise) to achieve the objectives? Will the changes to the work and work flow involve new knowledge and / or skills? Just how different will performance need to be? Can the performance changes be achieved by retooling existing staff, or will new staff need to be hired? When and where will support for this new performance be required? Once you have provided the baseline skills and knowledge, how will you reinforce them on the job? What job aids, coaching, or other types of support will be needed to bridge the gap between the learning environment and the workplace? How does that new performance need to be supported by the business? How is the organization going to reinforce this performance change? What types of recognition, rewards, or other incentives will be needed to drive the right behavior? 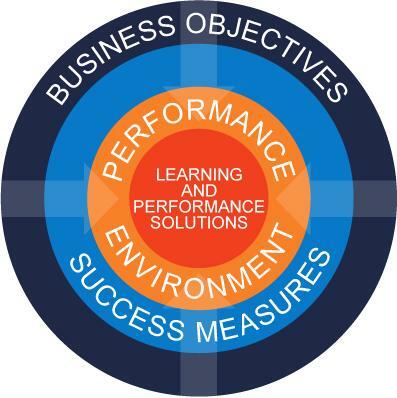 How are you going to measure the achievement of the objectives in business terms? More robust, more complex, and more complete – Your solutions should have the right mix of formal learning, structured informal support, and experience. Better understood (and accepted) by business leaders and managers – Your ability to relate your proposed solution in business terms should facilitate true understanding of and buy-in to the approach. Better supported in the context of business processes – Because your solution goes beyond formal learning, it should provide easier, faster and more complete integration into the work flow. More easily measurable against the business needs – Your ability to show measures of success in business terms should make it easier to demonstrate your success over time. Learning organizations are constantly challenged to prove and defend their relevance, and to make certain that the L&D budget is being used wisely. A robust outside-in learning approach can really help to connect the dots between the needs of the business and what the learning organization is doing to meet those needs.